A statewide grassroots campaign against the anti-worker SB 5 resulted in a huge defeat for GOP Governor John Kasich’s attack on working families. Mobilizing members was key to the effort. Above, District 54 Business Representative Mark Chema talks with an IAM retiree about repealing SB 5. In a major setback to GOP attacks on collective bargaining rights, Ohio voters resoundly rejected Republican Governor John Kasich’s assault on public sector employees by an astounding 61 to 39 percent margin in Tuesday’s election. Kasich and the GOP-controlled Ohio state legislature pushed through SB5 last spring. SB 5 severely limited collective bargaining rights for state employees including teachers, police and firefighters. In response, labor and community group volunteers collected a record 1.3 million signatures to force a state referendum on SB 5. The ballot measure was named Issue 2 and asked voters to choose between keeping SB 5 on the books by voting “yes” or scrapping SB 5 by voting ‘no.” Sixty-one percent of voters voted “no” and repealed SB 5. 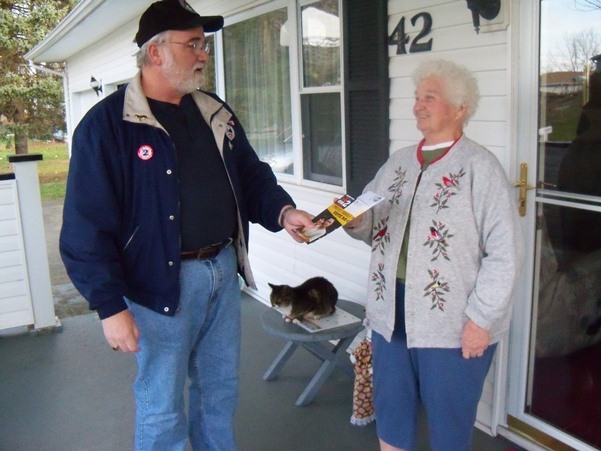 IAM members across Ohio were key to the grassroots repeal effort. For example, members of District 54 held steward trainings, manned phone banks, did neighborhood walks and staffed informational booths to educate the public and fellow members about repealing SB 5. In other election-night news, Kentucky Governor Steve Beshear weathered a barrage of third-party attack ads to win another term. Maine voters restored same-day registration for voting. New Jersey voters kept a Democratic majority in the legislature, despite GOP Gov. Chris Christie’s efforts to install a GOP majority. And, pro-working family legislators won several special elections in Iowa and Washington state.